Invite the Scripture Lady to present her preschool Bible song program “The Fruit of the Spirit” – a fun Scripture-filled musical presentation for young hearts. Ahhh! Yummy delicious fruit! Which one is your favorite? Peaches? Strawberries? Grapes? I bet your little ones have a favorite. But the real question is do they have a favorite fruit of the Spirit? They’re are 9 of them, you know – love, joy, peace, patience, kindness, goodness, faithfulness, gentleness and self-control. 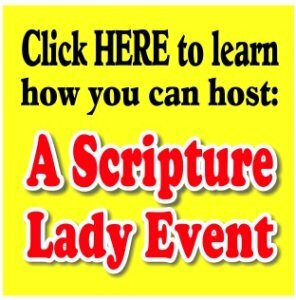 Let the Scripture Lady come and share her creative Bible song program that will introduce your preschoolers to all 9 of the fruit, but focus especially on the first three: love, joy, and peace. Teaching Point #1: God gave us 9 fruits of the Spirit. Teaching Point #2: There are 9 wonderful fruits of the Spirit, but today we’re especially going to learn about the first three – love, joy and peace. Let’s learn about love. Teaching Point #3: Let’s learn about joy. Bible Game #2: The Giving Apartment – Here is a fun listening game your preschoolers will play to help them learn different ways people give of their time, talents and love. Teaching Point #4: Let’s learn about peace. Bible Skit: “The Peace-o-Meter” – The Scripture Lady loves sharing creative ways for children to learn about God’s truths and her “Peace-o-Meter” does just that. It also provides a lot of extra giggles as both teachers and children are “measured” for how much peace they have in their lives. “The Fruit of the Spirit” lasts about 35 to 40 minutes.